We get lots of questions about our washer/dryer! Does it work? Do we like it? Click the link to find out! We moved our tiny home on wheels for the first time. Wanna see how we prepped for the transportation? How do utilities work in a tiny home? How does the cost compare to a traditional home? Here's our experience so far! If you have a beautiful home like Tiffany you have to light it up at night to show it off. Heres how we installed landscape lighting on our tiny home. Wanna grab a slice of reality of tiny living? Pause HGTV and see what the shows don't talk about. Wondering what products come in handy keeping a tiny home clean? Check out our experience with our tiny vacuum, the Dyson car and boat model! We had to replace some of our windows after a couple months and here is how they work. Super easy! Ever wondered what a grocery delivery service has to offer? Check out our experience with brandless.com! Here is our story on our scrabble to get our tiny home safe from a hurricane in 24 hours. Mosquitos in Florida are more like birds! What do we use to fend them off? Check out our blog post! What's it like living in an RV park? For some tiny home owners, this option doesn't seem appealing. But we love it! Read more about our experience here. Oliver is known to be a messy eater. We have tried a bunch of diffrent things for this and found that this worked best in our tiny space! So we wanted a TV in our master loft but didn't want to have this big ol' tv in our tiny space. So we made our own projector set up in five easy steps! Lighting is important in a home. Its even more important in a tiny home. In this article Tim points out some basic lighting technques for lighting in your home. Wanna have a smart home? Well here's the first step with the Amazon Echo! Wanna know how to brew your own Kombucha in a tiny space? Check our 4 step "how-to" on starting your own batch! We hear the number one struggle for people trying to go tiny is having trouble finding a place to put their new home. Here is our experience on how we found a place to put Tiffany. My experience making custom curtains for Tiffany's 17 windows! Well, it has been a little over a month! Check out what we have experienced in the first month of living in a Tiny Home and a couple questions we typically get asked! 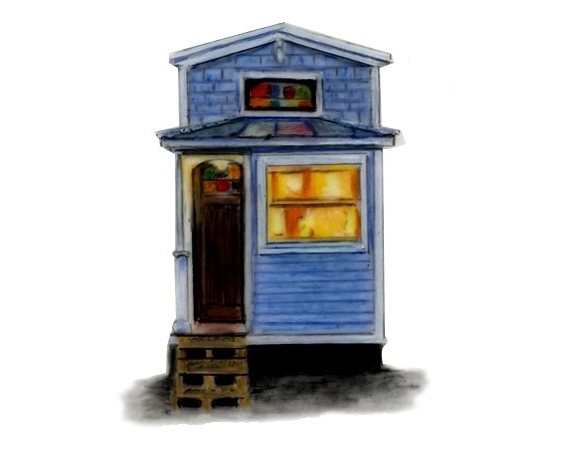 Try a Tiny Home Before You, Buy A Tiny Home. Looking to buy a tiny home? We suggest you try a tiny before you buy a tiny! This post is about our experience and what we learned at Tiny House Siesta Beach Resort and how important it was before we bought Tiffany.